Falling is responsible for 70 percent of accidental deaths in older people. Poor lighting conditions are often the culprit. Fortunately, researchers have recently identified a potent nutrient derived from black currant that specifically supports eyesight in dark conditions. Known as cyanidin-3-glucoside or C3G, this natural compound promotes the healthy function of delicate structures within the retina that help with night vision. Now you can protect eye health and support night vision with the new Super Zeaxanthin with Lutein, Meso-zeaxanthin Plus Astaxanthin and C3G. Each ingredient in this enhanced formula supports factors involved in promoting healthy eyesight. The density of your macular pigment (composed of lutein, zeaxanthin, and meso-zeaxanthin) is essential to proper vision. Unfortunately, this density declines naturally over time. Some aging people also lose their ability to convert lutein into mesozeaxanthin inside their macula. Eating lots of lutein- and zeaxanthin-containing vegetables can help maintain the structural integrity of their macula. However, since meso-zeaxanthin is not part of the typical diet, it cannot be replaced except in supplement form. Super Zeaxanthin with Lutein, Meso-zeaxanthin Plus Astaxanthin and C3G gives you therapeutic doses of all three carotenoids to help protect your precious eyesight. If you’re one of the more than 72 million people in America who use a computer daily at work, you’re probably familiar with eye fatigue. Staring at a fixed-distance object such as a computer screen for a long period of time can cause the muscles that focus your eyes (called the ciliary body) to tire or go into spasm. This can result in physical symptoms such as head discomfort, sensitivity to glare, tiredness, soreness, dryness, and blurry vision. Super Zeaxanthin with Lutein, Meso-zeaxanthin Plus Astaxanthin and C3G contains a potent dose of astaxanthin, a carotenoid found in the red algae Haematococcus pluvialis. Studies show that taking astaxanthin with other carotenoids protects against free-radical induced DNA damage, repairs UVA-irradiated cells, and inhibits inflammatory cell infiltration. 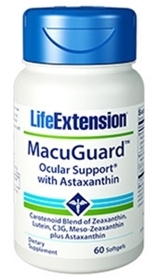 Astaxanthin also helps support vascular health within the eye and improves visual acuity. Its fat soluble property helps protect sensitive cells inside the eye. With its special combination of ingredients that target eye strain and protect visual acuity, Super Zeaxanthin with Lutein, Meso-zeaxanthin Plus Astaxanthin and C3G is truly an exciting breakthrough in eye care. Other ingredients: soybean oil, gelatin, glycerin, beeswax, purified water, lecithin, annatto, potato maltodextrin. OptiLut is a registered trademark of NutriScience Innovations, LLC. LuteinPlus and MZ are registered trademarks of Nutriproducts Ltd., Marfleet, CB22 5LA, UK, licensed under US Patents 6,218,436 & 6,329,432. Zanthin is a registered trademark of Valensa International, Inc., used under license. U.S. Patent 5,527,533.